Posts tagged "Warning Letter Format"
We all know that smoking is injurious to health and most of the organizations do not supporting smoking or consuming tobacco in office premises. And for that they issue “No smoking in office premises letter” which work as a no smoking notice for employees. Sometimes warning letter to employees for smoking in office premises or warning letter for chewing tobacco in office are also sent to maintain the decorum at work. There are various Sample of Circular for No smoking to follow. 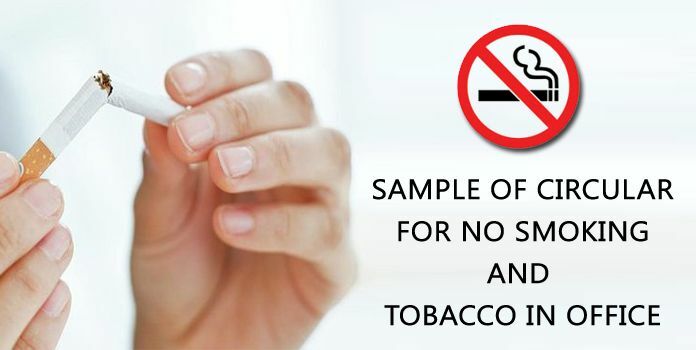 In this post, we have come up with Sample circular format for No smoking. You can use this format template and also know important points to follow. With an intention to safeguard the health of all the non-smokers at A to Z Technologies, we have decided to make our company completely free from smoking, effective from February 5th, 2019. We all are aware of the adverse effects of smoking tobacco on health and environment. Therefore, the Company’s Policy covers any kind of use of tobacco in company’s premises. Because of bad effects of smoking, the Company has decided to completely ban it in the premises, except the areas which have been specially reserved for smokers under “Smoking Zones”. Therefore, smoking is prohibited in all the work areas, meeting rooms, private cabins, conference rooms, auditorium, canteen, corridors, visitor’s hall, restrooms, stairs and all the other adjoining areas. For all those who wish to smoke, you can do so at the “Smoking Zones” which have been created at Ground Floor and Second Floor of the building. All the employees are advised to strictly follow these changes in the policy of the Company. In case of any violations, strict actions will be taken against. All the employees are strictly advised to adhere with the changed policy. Any violations of this policy will be handled through the standard disciplinary procedure. Whenever an employee of the company goes on a business trip, as a protocol, he is suppose to inform the HR of the company. But if an employee without informing the HR goes for a business trip then the manager should write a Warning Letter or Memo to Employee expressing your disapproval on this kind of behavior. This is a kind of Warning Letter for Absenteeism Without Intimation sent by HR to the candidate. We have come up with a formal format for Memo to employee who went on a business trip without informing the HR. It is a short and sweet letter. With deep regret, we would like to inform you that Management is extremely unhappy with this kind of irresponsibility at your end. You went on a business trip to Mumbai for four days without intimating about it to the HR Department because of which a lot of chaos happened. Moreover, the bookings for the same were to be confirmed and again led to inconvenience to you and to the company. This kind of a mistake has happened previously in the past and you were warned to not repeat it. The Management would like to have an explanation from you in writing explaining the reason for the same. Meanwhile, you are warned again, and this time, for the last time, to not repeat such a thing in the future. Create a personalized Warning Letter to Employees Refusing to Work using this sample. A professionally drafted Employee Verification Email Format to HR with precision. An organization has all kinds of people. Well some are very prompt with doing the task assigned to them and some on the other hand simply refuse to work. Every company has its own style of dealing with employees who say no to work. Writing a formal letter to employee who refuses to work is one way of warning them. Good companies always send warning letters in such scenarios. If you also have to frame a warning letter to employees who say no to work then given below is a template sample that you can follow. The management has been informed that you were assigned a job of dealing with our reputed customers on 12th July, 2017 but you refused to follow the instructions of your Manager. We would like to warm you that our Company will not tolerate any such kind of misconduct or negligence from your end. If any such behavior is noticed in future then you will have to face serious consequences as actions against termination will be taken. Consider this as a final warning and we hope that you would work without any negligence in future. A domestic Inquiry in a company is an internal inquiry made into some alleged misconduct by a company’s employee. The purpose of conducting such an enquiry is to find out whether the alleged misconduct is proven or not. In case the misconduct is proven then action has to be taken to recommend a punishment that is right for the offence committed. At the domestic inquiry, the employer presents his case and the employee is awarded an equal chance to put up his defense against the charges. It is alleged against you that you Mr. Shalom, Emp. No.1234, Designation: Assistant Manager (Marketing) had found sharing confidential details of the department with personnel of other department. Therefore, your are hereby required to submit a written explanation stating as to why a suitable action should not be taken against you for the above said misconduct. Your written explanation should reach to the management within 48 hrs of receipt of this notice. Failing to do so, it will be assumed that you have no explanation to offer and an action deemed fit shall be taken against you. Employees have to follow the discipline in whatever job they do as they are the face of the company. This has reference to letter sent by Mr. Vijay, Executive ……., that you did not report to the duty on the scheduled shift, on 08.09.2010 & 09.09.2010 and also there was no intimation from your end regarding the same. It is also been observed from the attendance record that you have been absented yourself from duty without prior permission, sanction of leave or any intimation whatsoever on 08.09.2010 and 09.09.2010, thus dislocated the work of the organisation. Your negligent act as above amounts to serious misconduct in accordance with provisions of the certified standing orders of the company warranting severe disciplinary action. However in view of your admission of your act and your assurance that you will not give room for such or similar instances in future, you are hereby let off with WARNING. It is hoped that you will take good advantage of the leniency shown to you and you will strictly keep up to your assurances.